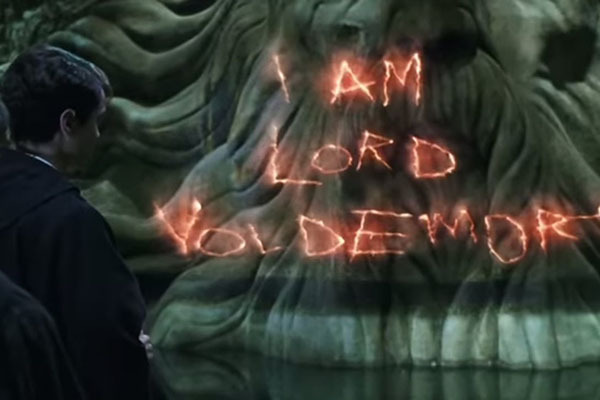 And yet, I'm happy to report that Harry Potter and the Chamber of Secrets is nowhere near as bad as I remembered (or feared). Unlike the first film, which felt like it had to introduce everything, reproducing every page of the originating text as a scene in the film, movie two wisely pares back many elements, crafting a more focused story that faster and more fun in the process. It's not a great movie, by any stretch, but it's certainly more competent than the first film. Better still, I can see from this movie why the film series continued, why people actually care about this world and the characters within (something Sorcerer's Stone never managed). 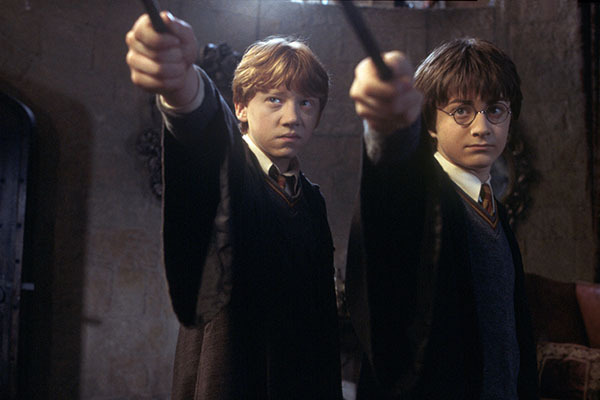 In Harry Potter and the Chamber of Secrets, young Harry (Daniel Radcliffe) heads back to school (with the aid of his best friend Ron Weasly, of course played by Rupert Grint). There, he, along with Ron and Hermoine Granger (Emma Watson), try to get settled into their second year at Hogwarts, but evil tidings are afoot. Multiple students are petrified, frozen like rock due to ill magics. Rumors spread about the heir to House Slitherin has returned, that they've opened the fables Chamber of Secrets, a room that supposedly has a magical force within it that can rid the wizarding world of muggle (non-magical people)-born wizards (because abject racism is alive in the Wizarding World). 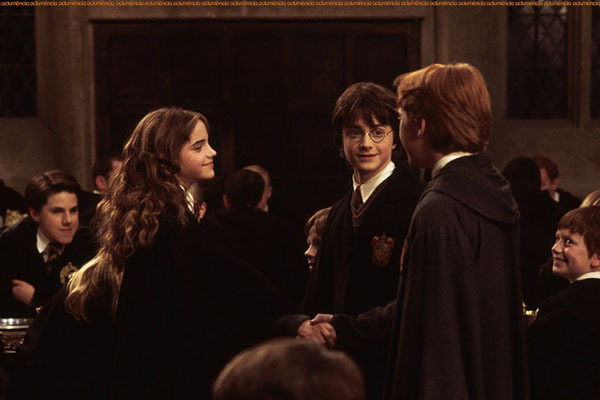 Harry and friends have to figure out what's going on, who the heir to Slitherin really is, and stop them from unleashing the power of the Chamber of Secrets, killing most of the student body. As much as I hate the first movie, Sorcerer's Stone does aid this movie in one respect: by slavishly detailing every aspect of the first book that film gets most of the setup out of the way so that this film, Chamber of Secrets can get to work on actually detailing a story. Not everything about this movie's plot works, but by establishing everything ahead of time this film is at least able to remain fleet of foot, burning through pages of text so we can get to the meat of the story. This movie is very much a mystery -- who is the heir and what do they want -- so the villain remains a secret for much of the film. That leaves all the focus on Harry and Co. and them bungling around the school trying to solve the mystery. It's tight and focused and works for what it is. My big issues with the plot are probably inherent to the novel it's based on. Essentially, the villain is kind of a cheat, a magical entity we have no way of knowing exists and only makes sense once they decide to start monologuing, explaining everything so that everyone in the viewing audience can understand what's going on. The villain themselves is effective, performed with malice and power. I just wish we could have had a better setup for them so that the mystery of the movie could be solved without a five minute "Bond Villain Speech" to fill us in on what's really going on. Sure, the movie tries, with little nods and Easter eggs to what's happening, but even knowing who the villain is (having watched this movie long ago and read the book once as well) I didn't see any way you could really solve the mystery of this film ahead of time. There's just not enough setup, not enough information conveyed to make this particular twist work effectively. It kind of deflates the ending, causing the movie to grind to a halt right at the big climax (which it should be ramping up instead). I also have issues with the general world-building of this film. Specifically, there's a lot that doesn't really seem to make sense about the school and the Wizarding World. Wizards aren't supposed to use their magic in the Muggle world, but Wizards live out in the Muggle lands, using their magic at home and at their jobs. Wouldn't this seem like a conflict, like it's only asking for trouble. In a setup like this, it seems like Muggles would already know magic exists because it's not like any of the Wizards are all that cautious about magic in their day-to-day. And if Wizards live among the Muggles, why don't they have a better understanding how that world works? Ron's father, who works in the Ministry of Muggle Relations (or some such) is confused by basic Muggle things, like a rubber duck. They live out in Muggle lands, though, so shouldn't they have a TV and a radio, things that would illustrate clearly how Muggles live? Maybe they they'd be able to blend in better in a world that isn't supposed to know wizards exist? Certainly, the students aren't learning much about controlling their magic... or, really, anything at all. Students barely attend class at Hogwarts, and the lessons they learn hardly seem like practical applications of magic at all. 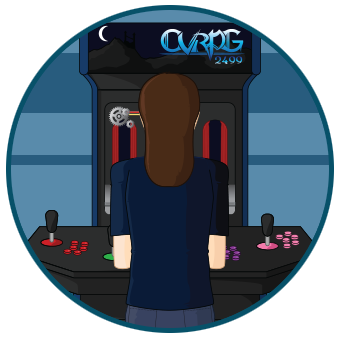 Plus, it's not as if the students are also learning reading, writing, and arithmetic along with potions and herbalism, so what practical skills are the students going to have when they graduate? Again, that's not to say that the story is bad -- I found myself enjoying most of the movie, grooving along with the plot beats as they came up because the film moves along quickly enough that you don't really stop to think about things. But on repeat viewings, these flaws stand out. It's issues of pacing, issues of setup and delivery, and basic plot holes that just don't work and don't add up to a satisfying whole. And yet, it's still a markedly better story, over all, than in the first film (which should reiterate how much of a misfire Sorcerer's Stone really was). Other aspects of the movie fair much better. I liked all the kid actors this time around (not that I hated them before) and feel like they're really growing into their roles, even one film in. There's a confidence to the lead trio that has been gained between movies one and two -- in the previous film they felt like kid actors putting on solid performances while here, in Chamber, they feel like the actual characters. Of course, with a year between filming the movies, the kids have notably aged, with both Harry and Ron looking much older here than they did at the end of movie one. That's not a knock against the actors, mind you, just something that comes up with the way these films were made. Also improved are the special effects this time around, with a much greater reliance on practical effects and puppetry. The first movie suffered trying to put cool moment into the film with CGI, and clearly the producers learned from that mistake as so many creatures (from a giant spider to a basilisk) are done with real props. 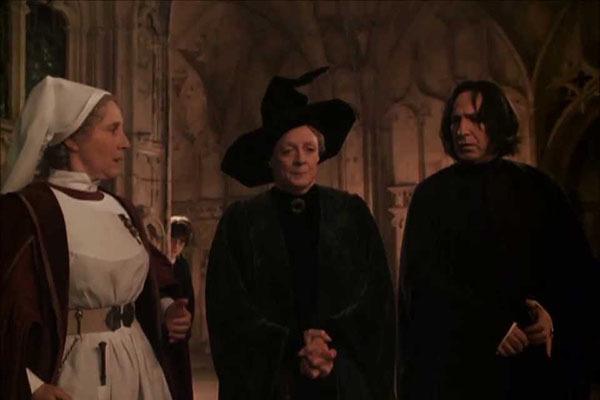 Even the sequences that are clearly CGI, such as the quiddich match at the mid-point of the film, look better this time around, without that noticeable green screen fuzzing the old action sequences had. Over all, this film feels more, real, more lived in, with a greater sense of reality to its unreality. 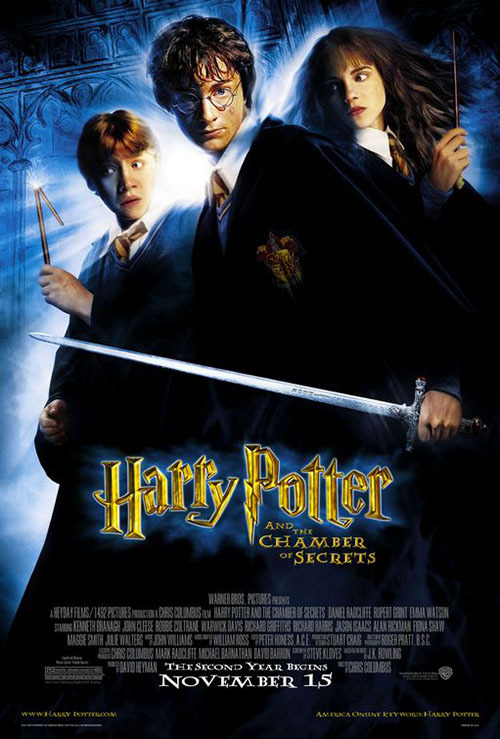 Harry Potter and the Chamber of Secrets is a solid mid-step between the rough first entry in the series and the phenomenal heights it will reach from the third movie onwards. It's not the best film, but it is watchable, with plenty of moments that will entertain. If this kind of production had been in the first movie, the whole series would have been great overall (without the questionable asterisk that begins it all).